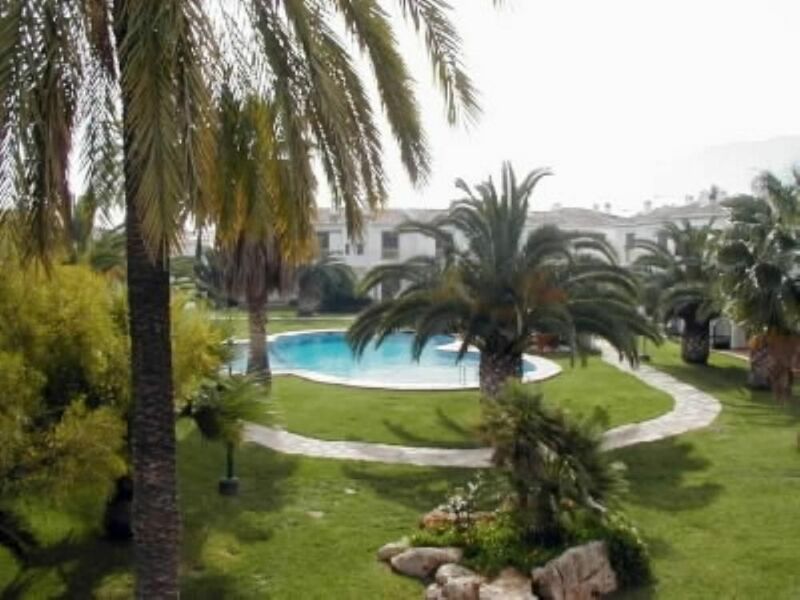 TO 350 METERS BEACH WATCHED, WITH TROPICAL GARDEN, DECORATION CARED, AIR CONDITIONING, DISH WASHER, GREAT SWIMMING POOL ONLY 1 KILOMETRO OF THE CENTER OF DENIA. THE HOUSE MAKES CORNER. HAS THREE TERRACES, ONE THAT GIVES TO THE SWIMMING POOL, OTHER IN THE BACK THAT GIVES A FIELD OF ORANGES AND ONE IN THE BROWN ROOM THAT GIVES TO THE COMMON PATIO. THERE IS A TOILET IN THE FLOOR BELOW AND A FULL BATH IN THE SUPERIOR. There are built-in wardrobes. THE AIR CONDITIONING IS ALREADY ON THE GROUND FLOOR AS IN THE HIGH. THERE ARE GARDEN AND TUMBON FURNITURE. It is our holiday home and we have it very carefully. It is a pleasure for us to offer you our house. We have made a guide to make your stay in Denia very pleasant. We wish you a happy holiday. The property is in a very quiet urbanization with direct access to gardens and swimming pools. To the beach you can walk and to the town too. The beaches have all the services and is of fine sand. You can practice all the sea sports, sailing, diving, etc. Very nice apartment lovely quiet complex. About 6 mins walk to long sandy beaches and a few restaurants and bars, about 30 mins walk into the town centre. They only supply sheets and towles at a cost of 15euro which was expencive on top of house rental. Also it would be better to have more then one set of keys, this was inconvient at times as we were a group of 5 adults. Owner response: Hi. Thank you very much for the rating. The cost of the sheets is specified on the website. There are many people who prefer to take the sheets and not pay money. That's the reason they did not include them in the rent. "Very comfortable bungalow at small and friendly complex. Good Spanish atmosphere." We were in the bungalow for the three weeks in the July 2014. We like the great bungalow and garden, swimming pool, a beach not far from the bungalow. The advantages are also the 2 condition inside the bungalow. The owners are friendly and courtesy. Hardly recommend! Seit über 10 Jahren fahre ich jedes Jahr im Herbst mit meinen Kindern nach Spanien in die Ferien. Nun, zum ersten mal war alles perfekt und das zu einem TopPreis. Alles Wichtige ist in der Nähe, schöne, überschaubare, lebendige Stadt, schöner Strand, schöne Anlage, praktisches Haus in dem alles funktioniert und sauber ist, in einer sehr ruhigen Umgebung. "nous avons eu du mal à trouver l'endroit exact mais séjour agréable, quartier calme, conforme à la description." "Résidence très familiale, pas trop grande avec accès tout proche de la piscine et la possiblité d'aller à la mer à pied en 15 mns environ, seul petit bémol nous n'avions pas de chaises longues comme la plupart de nos voisins, séjour agréable"